The scowling old man nearly bumped into me as he fled the sanctuary. As I turned to watch him stomp out to the parking lot, I asked a friend if she knew why he'd left before the service started. She replied, "You know how in your sermon last week you encouraged all of us to be more welcoming to newcomers? Well, after five people came up to him to introduce themselves, he blurted "Can a guy just be anonymous when he checks out a new place? I want to be left alone!" And thus concluded his seven minute survey of our church. It's not only cantankerous old men with a flair for storm-off exits who are turned off by hyper-friendly churches, however. As I reflected on that event, I realized that I too would be intimidated and overwhelmed by that many strangers approaching me, no matter how genuine and kind they were. 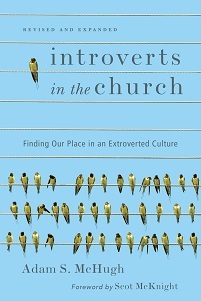 As it turns out, our churches are actually teeming with this species of people called "introverts." I am one of them, as is 50% of the American population, according to our best and latest research. Unfortunately, owing to a few antisocial types as well as to a general extroverted bias in our culture, introverts get a bad rap. Mainstream American culture values gregarious, aggressive people who are skilled in networking and who can quickly turn strangers into friends. Often we identify leaders as those people who speak up the most and the fastest, whether or not their ideas are the best. As a result, introverts are often defined by what we're not rather than by what we are. We're labeled as standoffish or misanthropic or timid or passive. But the truth is that we are people who are energized in solitude, rather than among people. We may be comfortable and articulate in social situations and we may enjoy people, but our time in the outer worlds drains us and we must retreat into solitude to be recharged. We also process silently before we speak, rather than speaking in order to think, as extroverts do. We generally listen a little more than we talk, observe for a while before we engage, and have a rich inner life that brings us great stimulation and satisfaction. Neurological studies have demonstrated that our brains naturally have more activity and blood flow, and thus we need less external stimulation in order to thrive. I saw the need for a book on this topic when I realized that our cultural slant had infiltrated some wings of the church, especially mainstream evangelicalism. As I say in Introverts in the Church, entering your average evangelical worship service feels like walking into a non-alcoholic cocktail party. 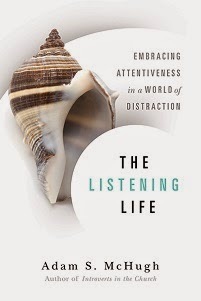 Evangelicalism has a chatty, mingling informality about it, and no matter how well-intentioned that atmosphere is, it can be a difficult environment for those of us who are overwhelmed by large quantities of social interaction and who may connect best with God in silence. Sometimes our communities talk so much that we are not able to express the gifts that we bring to others. If we are given the space, we bring gifts of listening, insight, creativity, compassion, and a calming presence, things that our churches desperately need. Even more dangerous is the tendency of evangelical churches to unintentionally exalt extroverted qualities as the "ideals" of faithfulness. Too often "ideal" Christians are social and gregarious, with an overt passion and enthusiasm. They find it easy to share the gospel with strangers, eagerly invite people into their homes, participate in a wide variety of activities, and quickly assume leadership responsibilities. Those are wonderful qualities, and our churches suffer when we don't have those sorts of people, but if these qualities epitomize the Christian life, many of us introverts are left feeling excluded and spiritually inadequate. Or we wear ourselves out from constantly masquerading as extroverts. Though I empathize with that old man, I wish he had endured the overwhelming hospitality of our community that day. He would have learned that the Christian life is not about anonymity, and we would have gained another introverted member who contributed valuable gifts to our community and ministry. Both he and our church would have been better for it. This article originally appeared in the "On Faith" section of The Washington Post.